Most of the featured music selections have been taken from CDs published by the Schnabel Music Foundation in cooperation with TownHall Records. Where appropriate the CD label [THCD-XY] is shown in the listing. L to R: Britta Matterne, Ann Schnabel Mottier, Teri Noel Towe, Radio Host at WKCR Columbia University Radio, New York, NY. A selection of 8 CDs produced by the Schnabel Music Foundation, ready to be used for the radio show at WKCR. Below are four segments representing the complete broadcast. Fourth segment of 32 min. Sarah Cahill in the KALW studio. 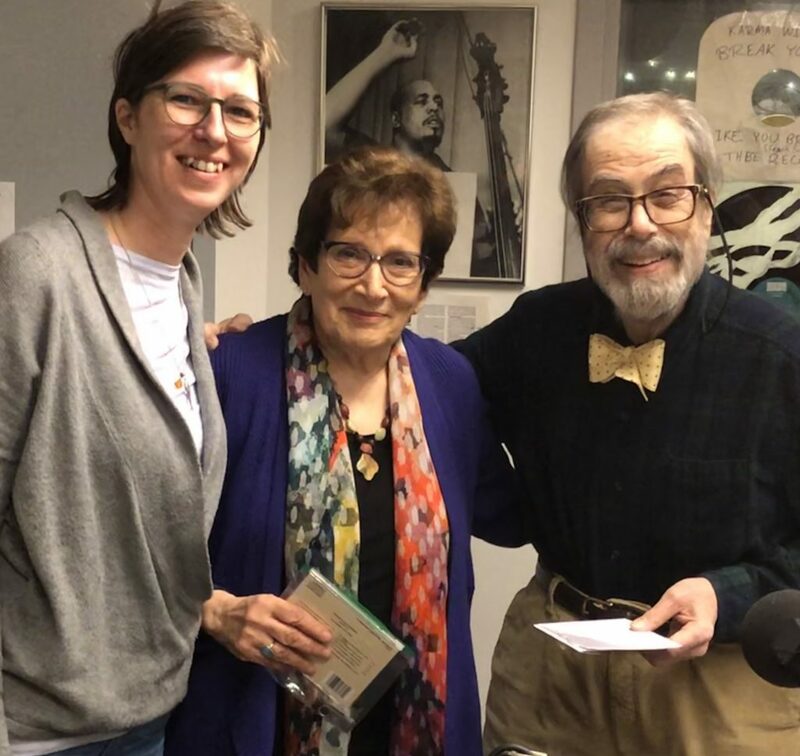 On Sunday February 24, 2019 Sarah Cahill received Ann and François Mottier for the yearly two hour radio show on the San Francisco radio station KALW. This show was focused on Karl Ulrich Schnabel to draw attention to the US Premiere of his 1933 film Das Kalte Herz (The Cold Heart) at UC Berkeley Art Museum and Pacific Film Archive [BAMPFA] on March 2. Below is the recording of the show divided into three segments. The source of the musical selections are CDs issued by the Schnabel Music Foundation through TownHall Records as shown below. Karl Ulrich Schnabel and Leonard Shure at two pianos Chopin Rondo in C Major, [THCD-58]. Start at 14 min 39 sec. Congratulations to Samuel Magill and Beth Levin for their new CD “Cello Music from Austria-Hungary” which includes a wonderful interpretation of Artur Schnabel’s Solo Cello Sonata. We are honored and pleased that Allan Evans, professor at Mannes College – the New School, New York, and director of the Arbiter of Cultural Traditions Company (reformed in 2002 from the former Arbiter Recording Company) has joined the Schnabel Music Foundation as Project Coordinator for the English edition of the correspondence between Artur and Therese Schnabel. He will also be In charge of preparing and restoring newly discovered or acquired historic recordings of Therese Behr and Artur Schnabel for publication by Arbiter Records. Allan’s vast knowledge will be an invaluable asset to SMF as adviser in musical matters.